When it comes to parting with my hard-earned cash in exchange for food, I’m all for knowing as much as possible about where my money is going to end up. Now people who buy a meal at Chick-Fil-A know that their money is going toward the obstruction of gay rights. There have been reports of the company’s donations to anti-gay organizations for years, but now president and COO Dan Cathy is officially out of the proverbial closet. In a July 16th interview with the Baptist Press (a Christian news organization that must be given credit for its delightfully punny catchphrase: “We have GOOD NEWS!”), Cathy discussed details of the company’s WinShape Foundation. First of all: WinShape? Oh, you’re shaping people to become winners, are you? Well, my unshapely windows want their portmanteau back. Well, two hundred foreskins might be pushing it, in my case. My dad would probably just get a few scraggly-looking chickens in exchange for me. At least then he wouldn’t have to eat at Chick-Fil-A. That’s fine. But now we all know that when we give Chick-Fil-A our money, we’re financially supporting anti-gay marriage groups like the Family Research Council and the Marriage & Family Foundation. Of course, local farms can use their profits to support whatever they want, too. So do the research. Where can you buy free-range chicken from a farm in your area? What will your money ultimately go toward? Check out Eat Wild, a resource with maps and information about pasture-raised meat and poultry near you. Because everyone knows that while cows apparently have the language economy of Hemingway and the dexterity to wield Sharpie markers, they can’t spell for sh*t.
Jumping on the SEO bandwagon? I don't really think it's a bandwagon...? Ok first of all, let me tell you something. Chick-fil-A made 4.1 billion dollars last year in gross profit (aka the money people spend on food there). and of their net profit (not gross profit) they donate maybe $10 million to organizations. That's .2% of the money coming in. So y'know how much money that is from your $3 sandwich? .6 cents. not even a penny. OK so now that we have things in perspective let's move on. Chick-Fil-A has been a christian organization since it's beginning. Y'know when that was? 66 years ago. They've also closed sundays, which is a HUGE profit loss form a company that size btw. Also they are a for profit company. Y'know what that means? It means that they make money, and they can do whatever the hell they want with it. They are not even funding organizations that are against gays. they just refuse to SUPPORT gays. Remember that time you told the homeless guy on the street you had no change? You didn't hate him. You might have even felt bad for him. But you didn't give him money. Does that mean you hate him as much as chick-fil-a "hates" gays? Yeah. that's what I thought. So yes. I agree that you jumped on the "bandwagon" because tolerance is popular. How about you make your own opinions and actually figure out what is going on before you post about it. Also, about your little "bible anecdote" that was actually more of an offering to show he was a worthy husband than "buying" a wife. He was impressing a father. Wow that NEVER happens. It also shows he was powerful and able to take care of her. Fathers don't just give their daughters away. You should know that. If you want to complain male practices in marriage I suggest you worry about domestic violence. That'd be something good to write about. Thanks for your comment, Chris. I appreciate your dissenting opinion. Certain things you included in your comment, specifically that "tolerance is popular" (if that's true, then wonderful, but I think most people working for gay rights wouldn't say they "tolerate" gay people existing and wanting equal rights, any more than we "tolerate" people in general); and "Fathers don't just give their daughters away. You should know that." I don't appreciate what seems like an attempt to put me in my place as a woman. Your implication that fathers give their daughters away at ALL makes me think that we will just never see eye to eye, unfortunately. I'm gay and I think that Chick Fil A being strong with what they believe in is awesome. I may not agree with it but who cares, its their money that their using from their privately owned company to do so. Instead of complaining about this one company out of many that donated money to certain causes, you all could be looking for ways to support your cause. You're for gay rights? Awesome go donate money! Chick Fil A happens to be against it, so they donate money also. 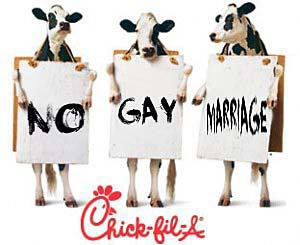 I don't see Chick Fil A banning gay people all because they have different beliefs. Do you? Nope! I eat there and they haven't complained about me for being gay! I'm sure they love my business just the same as a straight persons. So relax, not everybody will always have the same beliefs as everybody else, its called life. People believe in different things. That's what makes life fun and worth livining." I don't hate anyone. I live a life full of love and respect for all of God's children. I can't stand by and watch a group of tolerant, but not-so-tolerant Americans try to put out of business my fellow Americans, brothers and sisters alike, just because they don't see eye to eye with the President of the company who hasn't changed his views, hasn't changed the restaurant. He merely stated, nicely, what he believed. I don't know what Steve Jobs believed, but I love Apple computers. I don't know what the President of Trader Joe's believes, but I will continue to support an amazing business. I don't know what my local Healthy Home Market manager/owner believes, but I believe in American businesses succeeding. I hope I have not offended you in any way. It was not my intention. I just wanted to respond to your post. Have an amazing day! Thank you for your heartfelt, thoughtful comment! My point here was not to try to encourage people to put Chick-fil-A out of business. I just think it is important to think about the repercussions of what you purchase, including what you purchase to eat, even beyond your own health. I wrote this post to point out that people who are pro-gay rights (like me, obviously) and people who feel strongly about any other cause, for that matter, should do some research to see where their money is ending up. I don't want to put Chick-fil-A out of business at all - I just don't want to support them, because I wouldn't donate money directly to the causes they financially support (so why do it indirectly?). At this blog, I want to encourage everyone to understand where their food comes from and all the environmental, economical, and in this case political, repercussions that go along with it.